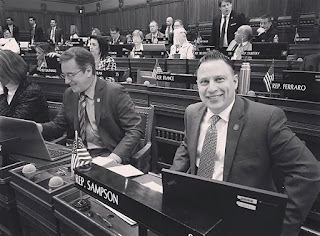 HARTFORD – State Representative Rob Sampson (R-80) joined a bipartisan effort in the Connecticut House of Representatives to pass the Republican, now bipartisan budget, approved late last week by the Senate in a 21-15 vote, and now en route to Governor Malloy for his signature. The vote took place during a special session of the House on Saturday, September 16, 2017 after months of discussions at the Capitol. This budget balances the state’s $3.5 billion deficit by making structural changes to Connecticut’s financial structure, agencies and departments. Spending would be focused on core government functions including municipal aid, education cost sharing and services for those with mental and cognitive limitations, all without raising current taxes or imposing new ones. The core premise of the GOP’s proposals was to stabilize the state’s political and economic climate in an effort to retain current business leaders, and attract new investments. Several companies that have relocated to other areas of the country have cited Connecticut’s unpredictable tax and credit climate as major factors in their decisions to leave. The bill is now in transit to Governor Malloy who will either sign it into law, veto the bill, or take no action, in which case the budget becomes law. In order to override a veto, the bill must pass each chamber with a two-thirds majority. If a budget is not signed into law by October 1st, the governor’s executive order will go into effect, which is expected to have major implications for local governments and school districts.